Despite its name, sandpaper isn’t made of sand, and often doesn’t even involve paper. 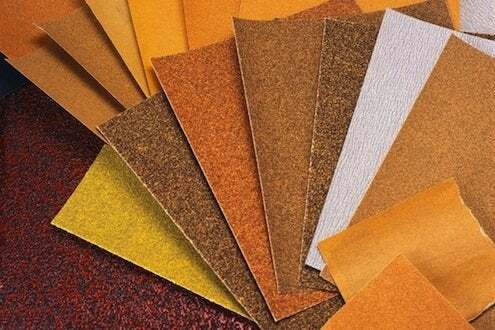 Sandpaper’s coarseness is measured in grit size, or the number of particles per square inch of paper. The higher the number the finer the paper. Coarse sandpaper, in the 40 to 60 range, is best for rough shaping or removing old finishes. The next step up, medium grit—between 80 and 120—is for general sanding and final shaping work. Fine grit, in the 150 to 180 range, is for final sanding. Very fine sandpaper, 220 through 240, is used for sanding between coats of varnish. Extra-fine and super-fine grits, beyond 240, are also often used in sanding of final finishes.